Long-term grout discoloration can cause tile floors to look dingy even after a good cleaning. With our new Hard Floor Surface Cleaning equipment, we can make your tile floors look like new. We power-wash the floor, cleaning the tiles and whitening the grout. After 72 hours, we recommend that you seal the tile grout to keep it clean and guard against future discoloration. Pressed cork floors have been around for centuries, and they’re becoming popular again because they’re eco-friendly and easy on the feet. However, they can lose their luster just like any natural flooring materials. We have the equipment and expertise to help you keep your cork floor looking great. The rubber flooring and vinyl tile often found in commercial or industrial settings is attractive and durable – a great investment, if you protect it. Nap’s Maintenance can strip, wash, and seal these floors so they’ll wear well for years to come. Gleaming hardwoods add a beautifully rich element to any business, but they do need some special care. 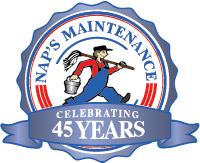 Nap’s Maintenance does not strip and refinish wood floors, but our method is perfect for maintaining your wood floor on a regular basis. We damp-mop to keep from scratching the floor, then complete the process with a bowling alley wax for ultimate shine and protection.